It has finally come to the end of the line for the San Diego travelogue, and perhaps my last blog post in a long time to come as I begin my journey through graduate school tomorrow. I’ll try my best to post on her, but life has a funny way of hijacking my best material. As always on Mastication Monologues, I plan on highlighting the culinary stops we made along the way during our travels as well as any fun or exciting events of note. Day three was much more laid back than day one or day two aside from a little shoe scare toward the end of our trip. As we woke up from our deep slumber from the crazy night before, we were definitely feeling the results of dancing and indulging ourselves all night long with great company. Thankfully, the newlyweds were hosting a farewell brunch for guests at another eatery on Coronado Island called Il Fornaio or “The Baker” in Italian. It was one of seemingly a million Italian eateries strewn about San Diego, but it was clearly inspired by the signature villas one could find in the Tuscan countryside with the sand colored walls and arbor vitaes lining the entrance. On the inside, it was light and airy with exposed woodwork and a kitchen that was open to the public eye. While we didn’t eat from the official menu since it was picked out to be more wide ranging for the multitude of guests’ palates, the waffles, eggs, and sausage that were provided were all excellent, especially the fluffy waffles topped with a spritz of whipped cream and some freshly sliced strawberries. We didn’t touch any of their alcoholic offerings like their signature mimosas or bellinis (a nod to the classic Venetian drink at Harry’s Bar), but they didn’t mess around when my fiancee asked for her personal elixir of life: Diet Coke. Once finished with chowing down on the delectable morsels, we strolled out onto the outdoor patio that overlooked the entire San Diego skyline. A breathtaking view for a trip that has felt the same way at certain points due to the immense amount of activities that were planned. We were under the canopy, soaking up the last few rays of humidity free weather, when suddenly Janice remembered she didn’t have her high heels from last night. I quickly traced our Uber driver down online and called him. Luckily, he had them in the back of his car, and offered to drive to the restaurant to drop them off. After we wished the Cua and Ng family goodbye and thanked them for their hospitality, our Uber driver arrived right on time with the goods. It seemed like nothing could stand in our way on this perfect vacation. Not even when we looking for a place to satisfy our rumbling stomachs as we waited for our plane. As mentioned in my day one post, the wedding party hosted a rehearsal dinner with barbecue catering. Lo and behold, Janice and I ended up eating at the same company’s franchise location in San Diego’s airport: Phil’s BBQ. After looking over their full menu of chicken, ribs, salads, sandwiches, and fixin’s, I decided to share a quarter rib dinner with Janice ($10). 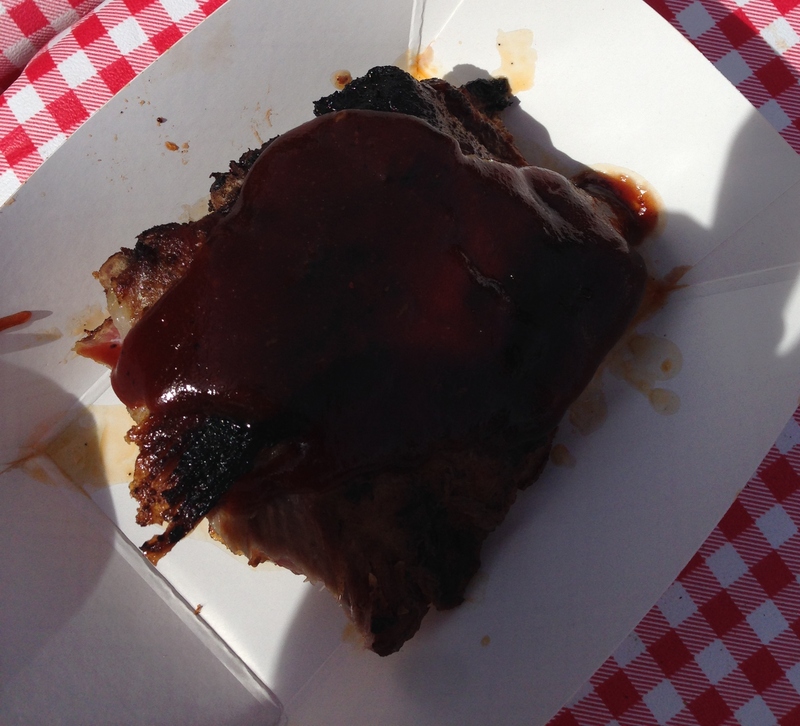 It included four of their ribs and with two small sides or one large side. We opted for the former choice in the form of potato salad and macaroni salad. It also came with a side of cornbread which might not be offered at their main restaurant locations. The ribs were smaller than the gargantuan ones offered at Sabrina and Thompson’s rehearsal dinner, but that didn’t mean that they were lacking in flavor. The tomato-based sauce was on the sweeter end with not much of a smoky profile to it. They weren’t as mouth-wateringly transcendent than the Twin Anchor ribs back in Chicago, but they were better than some fancy Italian dining at Sbarro. The sides were competently made but nothing of note. I did enjoy the cornbread that was warm and soft without the waterfall of crumbs that typically accompany each bite of cornbread. I’d recommend trying Phil’s BBQ if you have a layover and want to try some Ohio style bbq, but it isn’t a must for any traveler. At least the food was more satisfying than the Euro 2016 final between Portugal and France we watched. By the time we were boarding, Ronaldo was lifting the trophy, elated beyond words, while we were less than enthused to come back to reality after such a wonderful time. Perhaps the West coast really is the best coast after all that we saw, experienced, and tasted. Until next time, readers! Keep on traveling and eating! Posted in American Cuisine, Barbecue, Breakfast, Chain Restaurants, Mixed Drinks, Non-Alcoholic, Soft Drink and tagged airport, bbq, bread, corn, Coronado, cream, Food, Il Fornaio, Italian, macaroni, pasta, pork, potatoes, salad, San Diego, sauce, strawberries, Travel, waffles, whipped. Bookmark the permalink. The Cellar: It’s Goin’ Down! Happy Fall to all with this newest edition of the funkiest and freshest food blog in Chicago, Mastication Monologues. 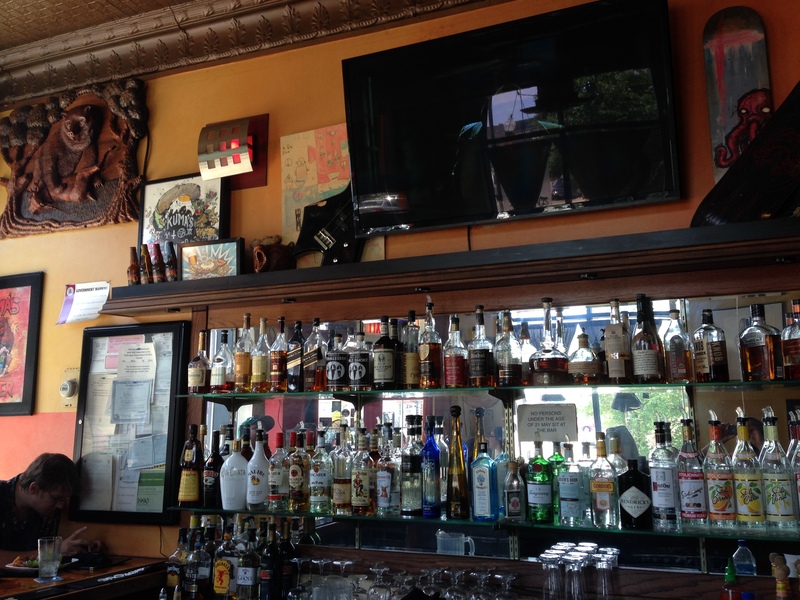 Today’s entry takes us north of the City to the university town of Evanston, home of the Northwestern Wildcats and the American fusion diner known as The Cellar. It seems that it is located next to a wine and tapas bar that is called the Stained Glass, but we went to the restaurant for a dinner date earlier this summer. Even though it wasn’t the actual tapas bar, I was informed that most of the dishes were designed like tapas, i.e. 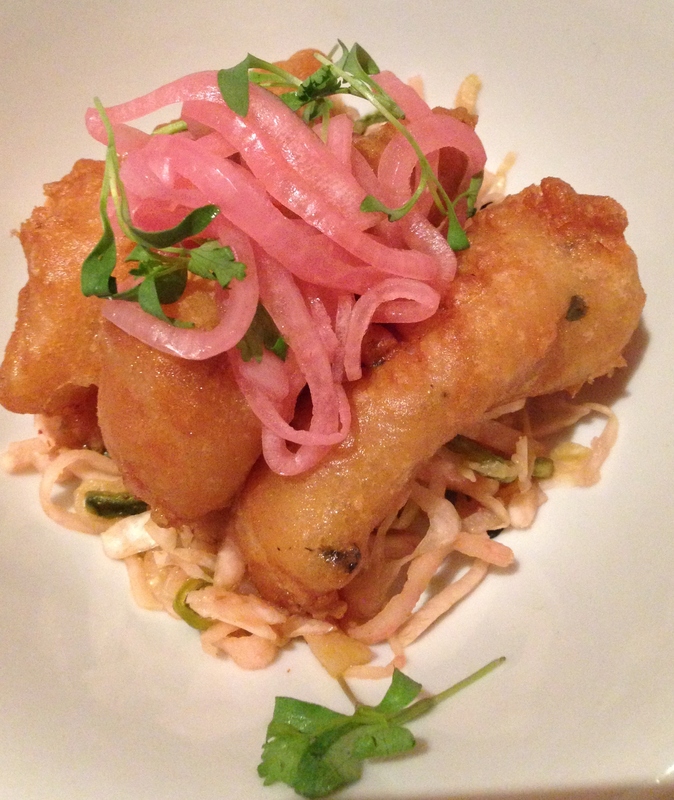 smaller portions that are meant to be shared (as oxymoronic as that sounds). 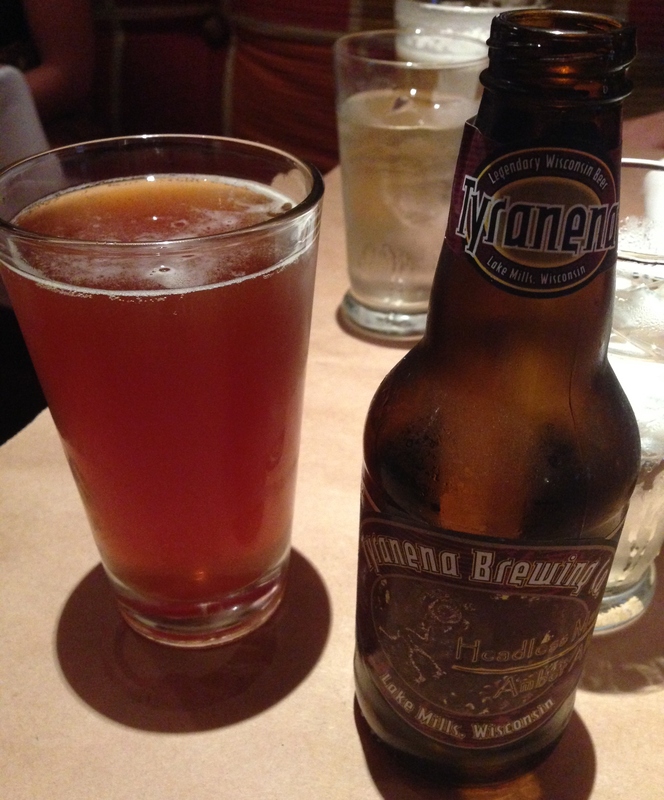 I started with a cold brew in the form of a Headless Man Amber Ale from Tyranena Brewing in Wisconsin. It definitely was an aromatic choice that had a slightly hoppy aftertaste with hints of caramel throughout the beer. It was light though to compliment the first dish of the night: the butter and salt flight with a warm loaf of sliced French bread ($6.50). If you blinked, you would have missed it being set on the table since we devoured every morsel. This dairy-palooza sported three different types of butter: Parmigiano Reggiano butter with fleur de sel, goat’s milk butter with pink Himalayan salt, and truffle butter with truffle sea salt. The Parmigiano butter with the fancy French sea salt obviously tasted nice and cheesy but not obnoxiously so. It was personally my favorite since the goat’s milk butter wasn’t as pungent and strong as I would expect from a butter that should have had the soul of a good Feta. With the truffle butter, I was somewhat surprised that it didn’t possess the aromatic potency I’d expect from the world famous and ludicrously expensive fungi that I sampled firsthand at London’s Borough Market. I still would recommend this appetizer though. 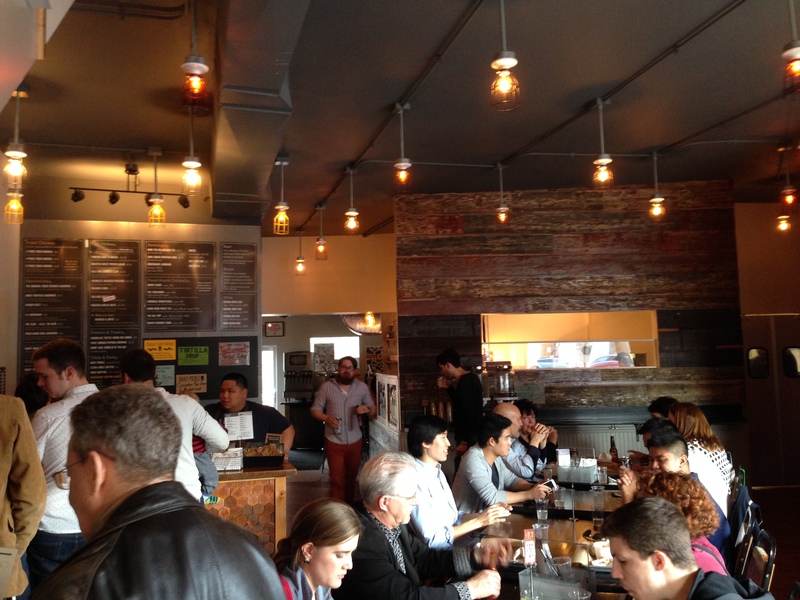 Our second round consisted of the elotes callejeros ($4.75) and the smoked salmon flatbread ($12.50). 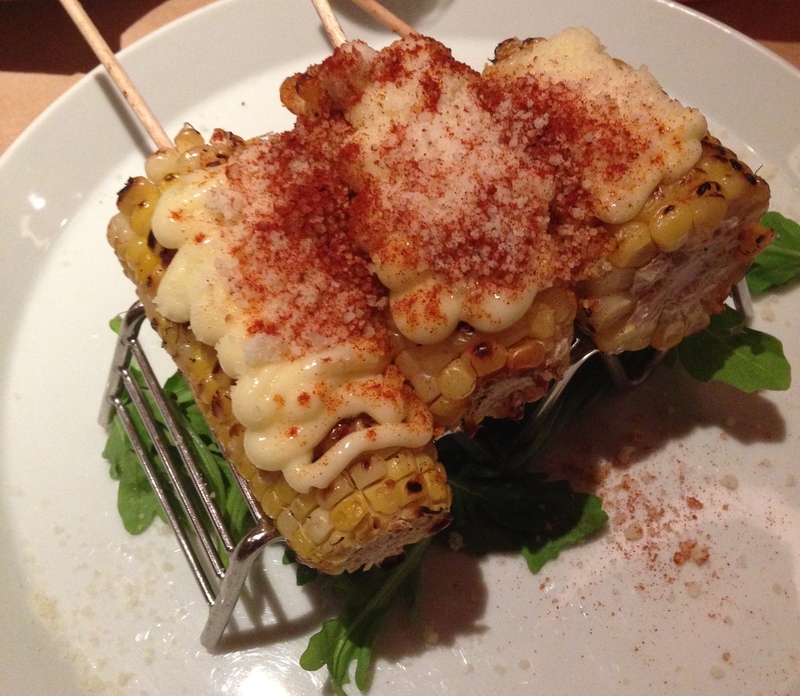 The former was a nod to the Mexican street food scene (calle meaning “street” in Spanish), and it shown through with the fusion of smoked paprika and grilled corn. The mayonnaise was a more savory choice over the typical butter one can find at any picnic in ‘Murika. 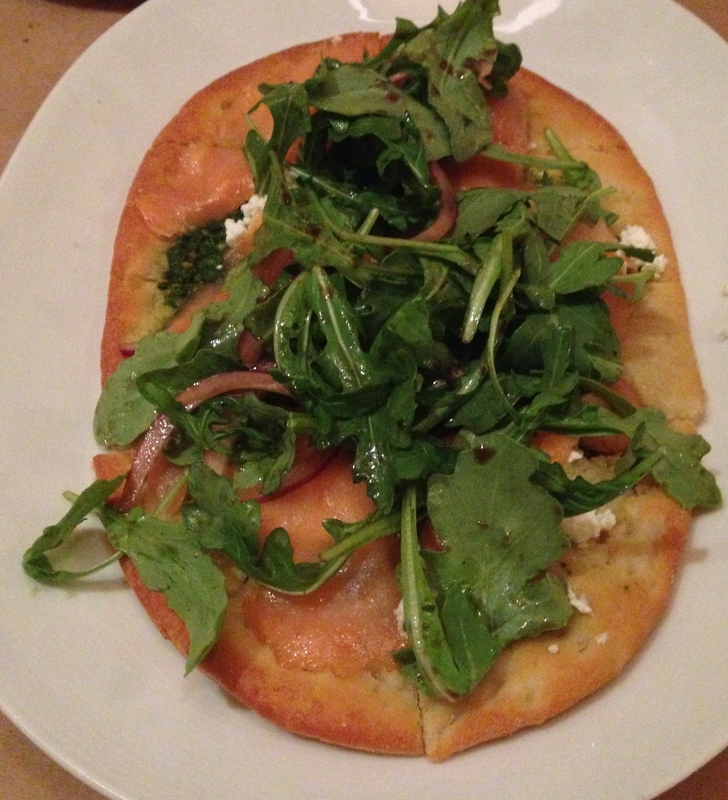 It was a more decadent partner to the more understated smoked salmon flatbread. This bite of more Northern Europe cuisine with the cold salmon and greens reminded me of the Swedish flatbreads common to smorgasboards. Instead of a white cream, they utilized a more Mediterranean flavor with the pesto sauce and goat cheese. 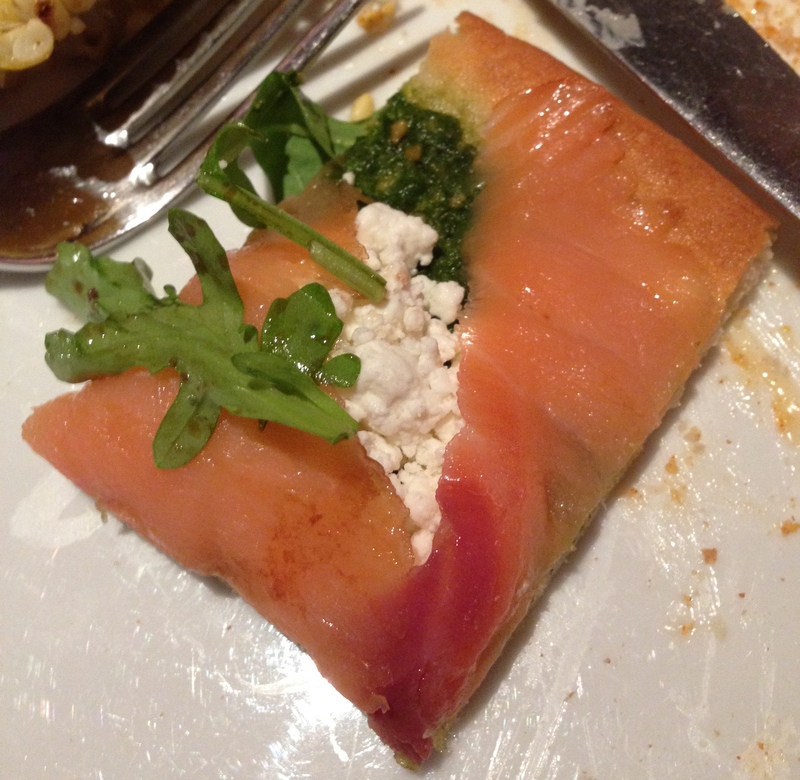 It all kind of overpowered the salmon itself, but I enjoyed the herbal pesto along the creamy, potent goat cheese. It was delicious, but if you’re looking for a great salmon meal, look elsewhere. Our main dishes finally came. I got the shrimp tacos ($13), and Janice got the empanadas ($9.50). 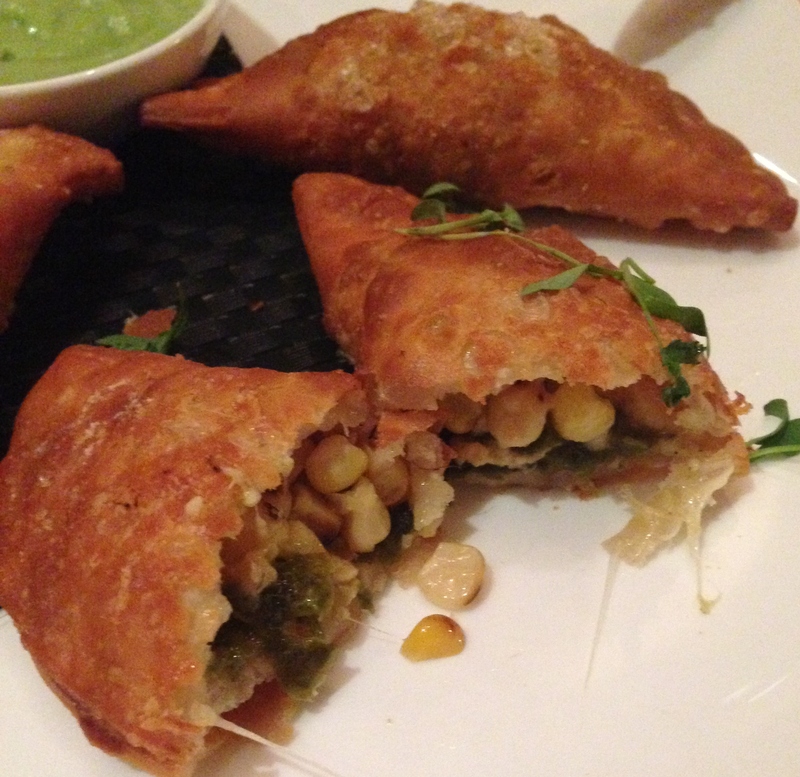 The latter consisted of the ubiquitous, fried Latin turnovers filled with roasted poblano peppers, sweet corn, Oaxaca cheese, and avocado-tomatillo salsa on the side. 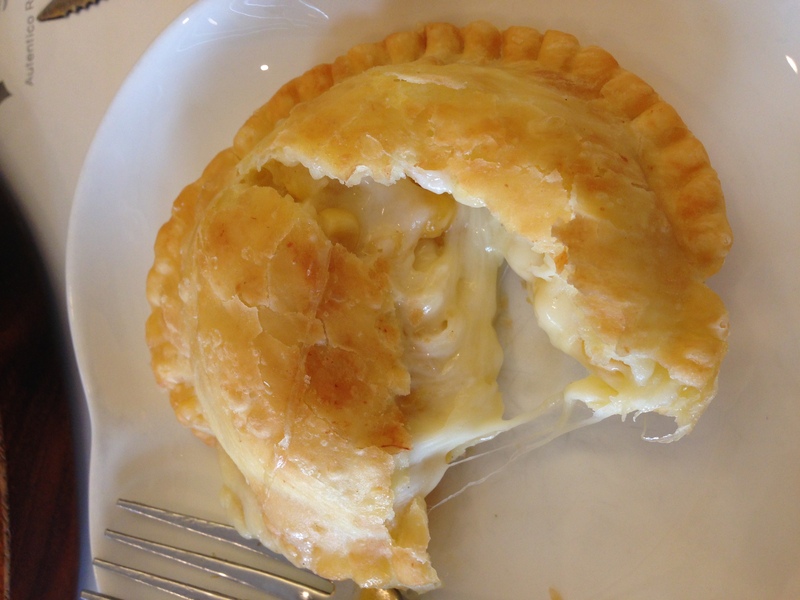 The flaky yet crunchy crust was bursting with the spicy peppers and were countered with the creamy cheese and sweet corn. Plenty of textural and flavor contrasts that worked together in harmony. 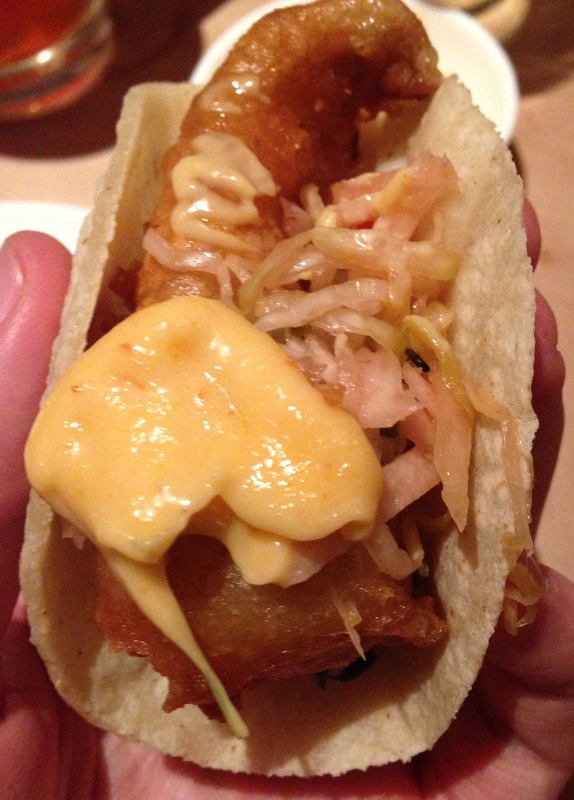 As for my tacos, I felt that the tortillas were a bit too small for the fried pieces of seafood that were resting on a kale citrus slaw and topped with grilled sweet red onions. Once I piled all of these ingredients into the flatbread with a dollop of the semi-spicy aioli for good measure on top, I got a mouthful of quality food from beginning to end. The breading was buttery and golden brown, but the shrimp was just ok. However, the citrus slaw and semi-sweet onions provided the zest to the seafood that gave the taco a punch of ceviche flavor. Even though we were chowing down for a good while, we managed to find room for dessert which took the form of the creme brulee sampler ($7.75). 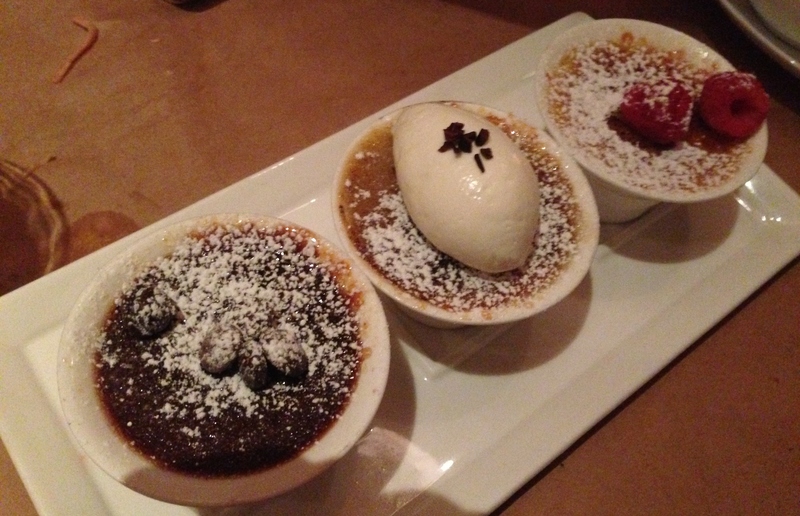 It was three small cups of high quality burnt sugar and egg custard with different kinds of flavor infusions. The Mexican chocolate one had a bit of a spicy kick in the form of cinnamon and a little hint of chili pepper. I’ll just say up front that this was my favorite, but the french vanilla was a close second. The chai one was my least favorite since it was a bit too subtle for my liking, but maybe you’ll enjoy it more than I did. It was a sweet flourish to a light but filling dinner. 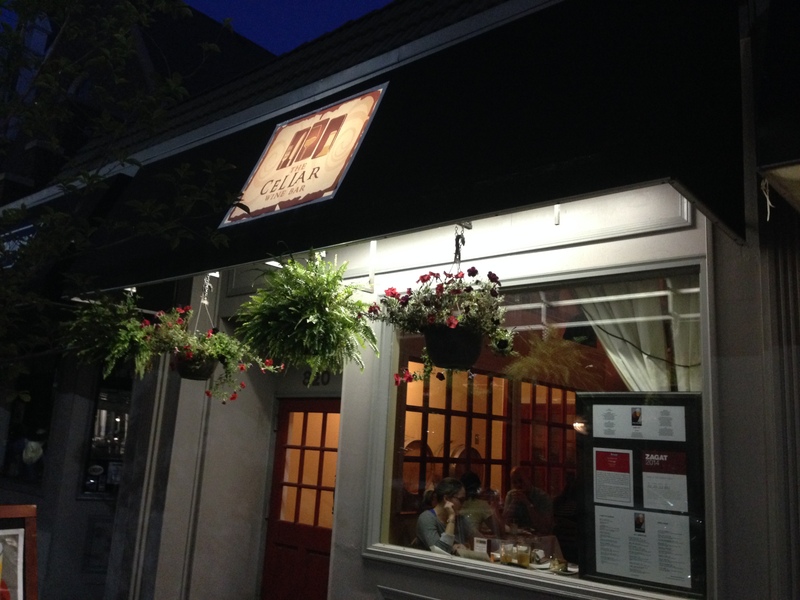 So if you are in the Evanston area and looking for a fusion restaurant that I could liken to a more affordable Girl and the Goat, check out The Cellar! 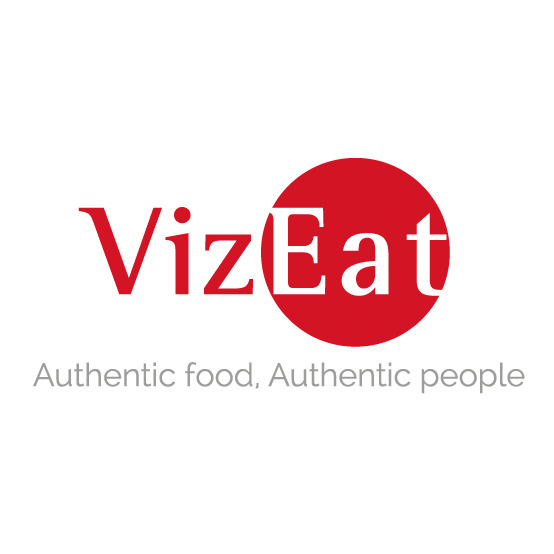 Posted in Alcoholic, American, American Cuisine, Beer, Beverages, European Cuisine, Latin American Cuisine, Mexico and tagged cheese, chocolate, cinnamon, corn, creme brulee, empanada, empanadas, Evanston, onions, restaurant, Reviews, shrimp, taco, tacos. Bookmark the permalink. 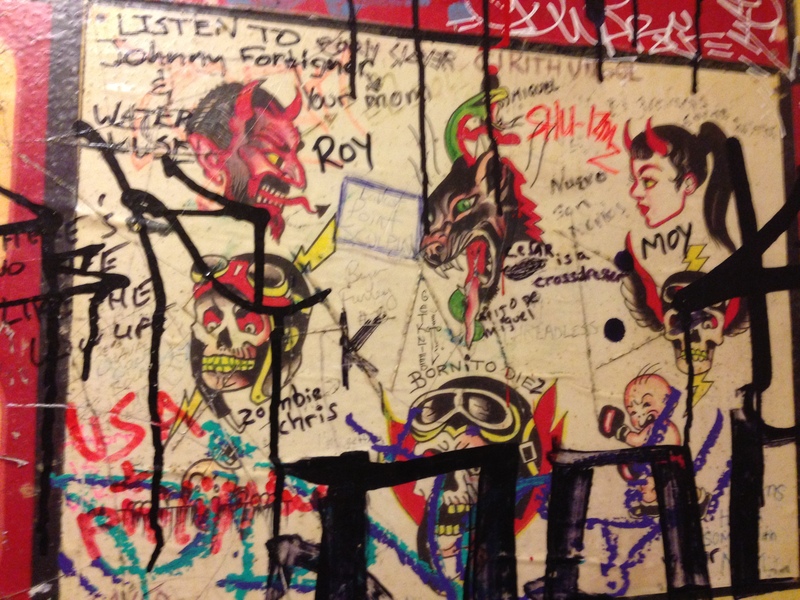 Art can be manifested in various mediums. While paintings and sculptures can be found all over the world from the beginning of humanity, music has a special place in the collective soul of mankind. It can reflect a gamut of emotions, cultures, and innovations in technology (or hatred of said technology). 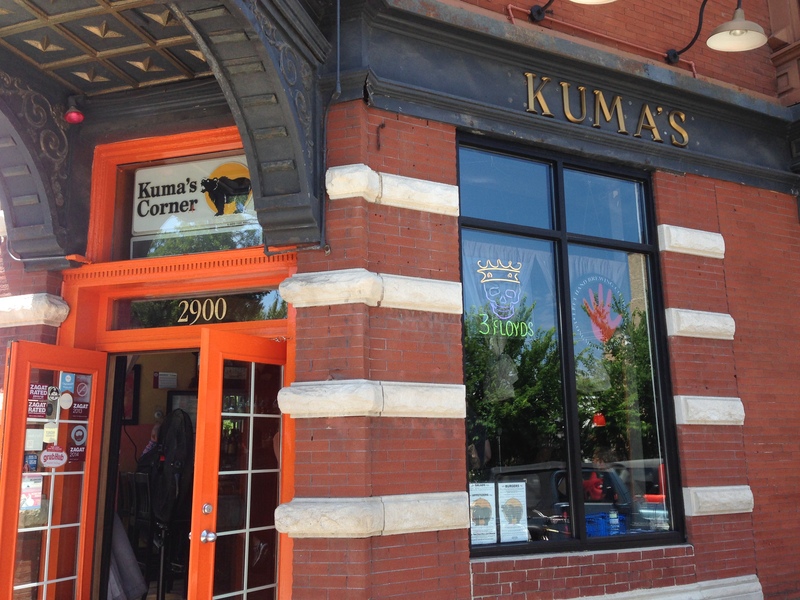 An eatery in Chicago called Kuma’s Corner (Kuma means “bear” in Japanese) manages to fuse metal music culture with a menu focused exclusively on creatively named and constructed burgers. What could be better than that? Now, I’m not a huge fan of death metal or really heavy rock music outside of listening to it on my workout mix, so I was curious to see why so many people kept on raving about their burgers even though they seemed like the last people to be headbanging or howling along with the gutteral lead singers. The exterior looked pleasant enough, but as soon as I walked in, I was greeted with a wall of people and fierce chords being pumped out of the speakers overhead. I was surprised though since I heard from friends that the music was turned up to 11, but I didn’t find that to be the case. Since I was dining alone, I was immediately seated at the bar, but I’d recommend bracing yourself for a wait if you’re going there around lunchtime. The bartender along with every other employee there was friendly and covered in tattoos. 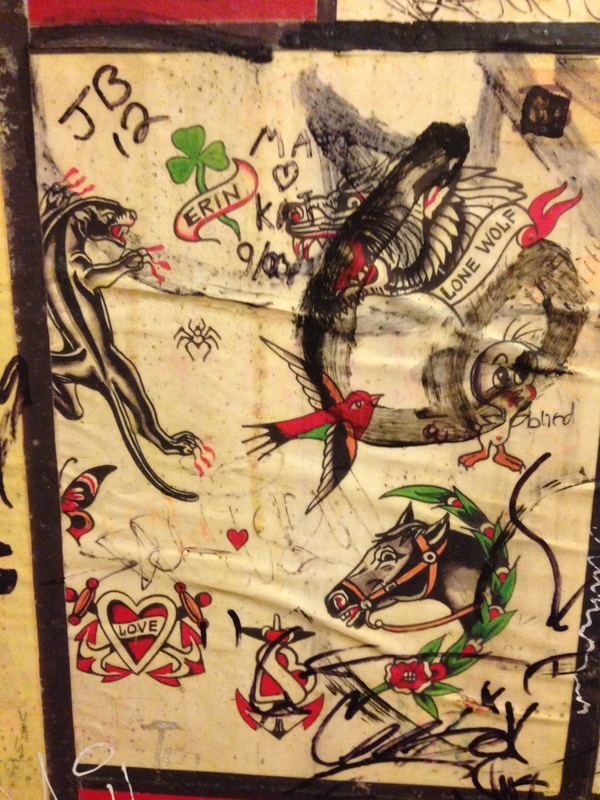 Not only did the artwork decorate my server’s arms, but I even found her probable inspiration all over the bathroom walls as every square inch was covered with tattoo samples. After sitting down and pouring over the burger options, I noticed that they had very creative names paying tribute to different rock bands like Led Zeppelin, Megadeath, Slayer, and Plague Bringer to name a few. Not only were the names intimidating, so were the options since they all looked so delicious. After bringing it down to two choices in my head, the Plague Bringer and the Goatsnake, I asked my bartender which she’d recommend out of all of them. Surprisingly, she said those two were her favorite. She then gave me time to think about it, and even said she’d surprise me if I couldn’t make up my mind. After some deliberation, I told her I’d take the Goatsnake ($10) along with a complimentary side of handcut fries, but I could have also picked chips or a salad instead of the fries. If you’re not feeling like a burger, they do have appetizers, salads, and sandwiches. After waiting for some time and slobbering on myself while checking out other peoples’ burgers, my burger was placed in front of me. I didn’t know where to start. It was overflowing my plate, and the guy next to me even asked me what I got since it looked so much more intense compared to his burger. Jackpot! This creation named after the doom metal group from California caught my eye because of its creative ingredients. 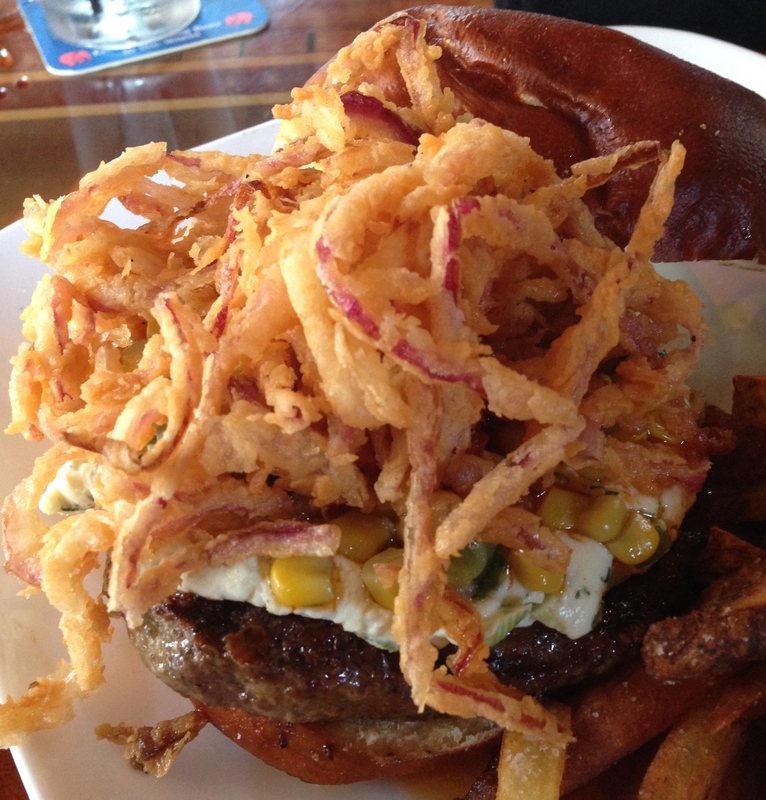 While there was a pile of fried red onion strings on top, I’ve had that on other burgers I’ve destroyed at other restaurants. The holy trinity of ingredients that piqued my interest was the herbed goat cheese, poblano and corn relish, and Cholula lemon vinaigrette. I could see the first two elements, and the third one could only be experienced. I put my top bun on and was ready to rock my socks off. Wow! From the first bite, I knew I was dealing with a unique burger. The patty was hearty and juicy but was borderline greasy. It didn’t take away from the bold flavors that were more radical than a face-melting guitar solo. The goat cheese was plentiful and provided a strong flavor background for the rest of the star ingredients like Lars Ulrich’s drumming for Metallica. 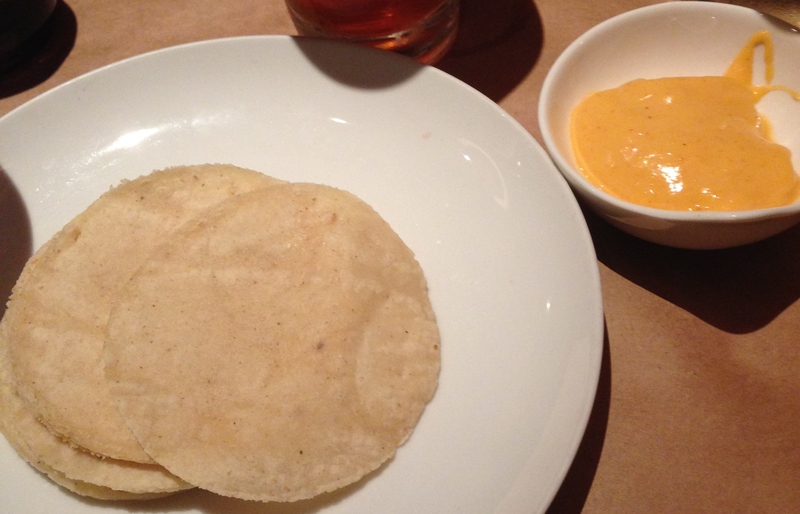 As for the corn and poblano pepper relish, it supplied a counterbalance of texture and a hint of spice that I enjoyed. Finally, there was the most outrageous yet memorable part of the burger which was the Cholula lemon vinaigrette. With every bite, my palate was awash with a spicy citrus punch that went especially well with the goat cheese that almost made it seem like they did an homage to Chicago’s saganaki legacy unintentionally. Once I demolished my main dish, I turned my attention to the fries. They were on the less crispy side which I perfer and weren’t too salty. I wasn’t sure, but I believe the ketchup had a bit of spice in it. Either way, these fries couldn’t measure up to the burger magnum opus I experienced moments before. The bartender finally saw the feeding frenzy was over, and offered me a round of applause with how thoroughly I cleaned my plate. 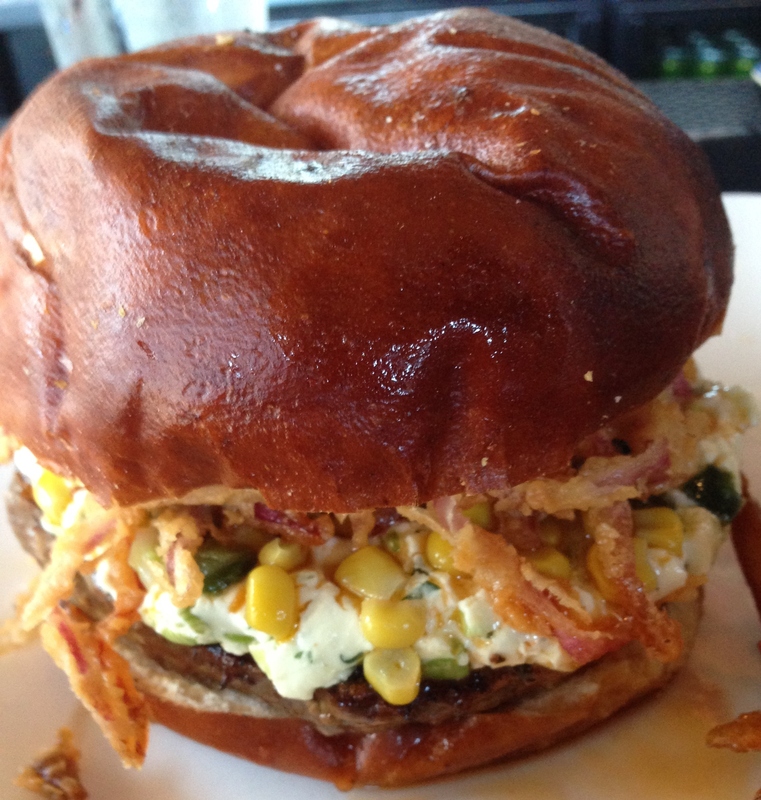 I applaud you too, Kuma’s Corner, for your passion for creating insanely delicious burgers. So if you’re tired of the same old burger joints that use the same old ingredients in the same old bar and grill environment, bear crawl on over to Kuma’s Corner and party on! 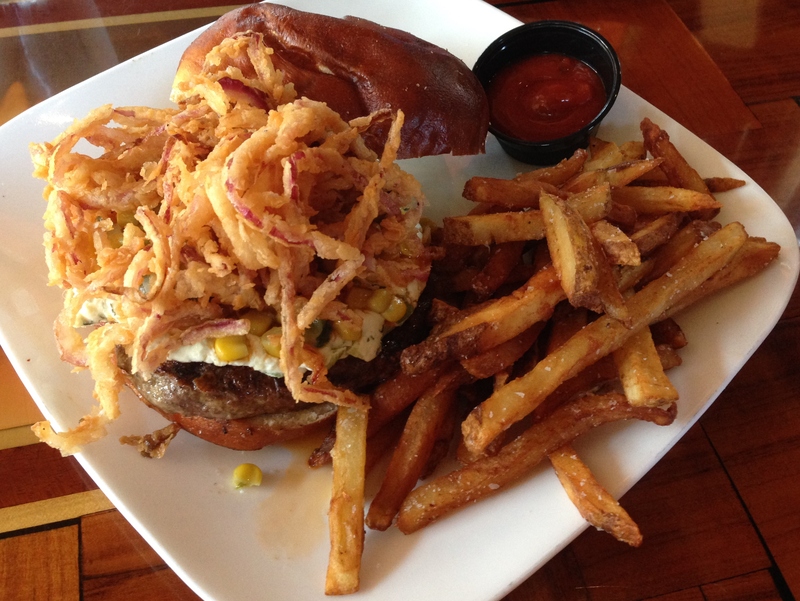 Posted in American Cuisine, Burgers, Comfort Food and tagged Bar, Beer, cheese, Chicago, corn, dining, Food, French, Fries, goat, hamburger, onions, peppers, potatoes, relish, restaurant, Reviews. Bookmark the permalink. Man, what a summer. 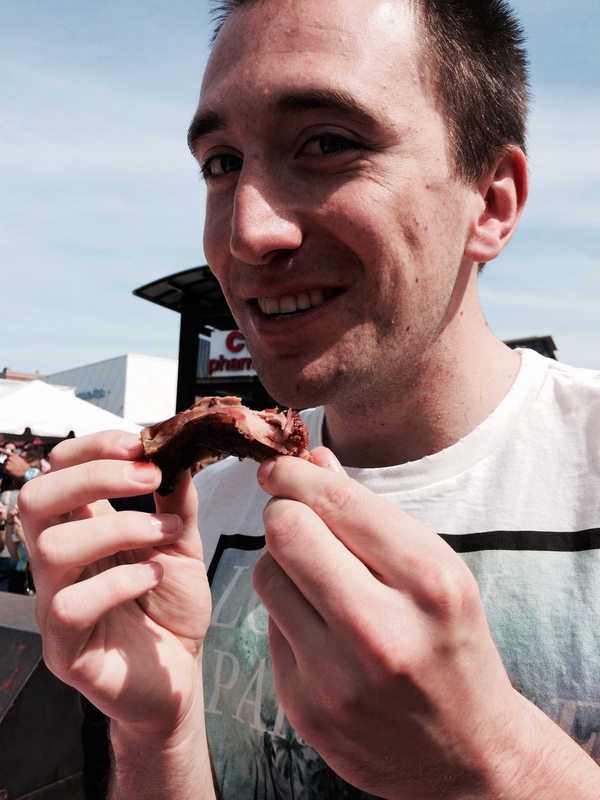 Just when I thought it couldn’t get any better with the weather improving and the World Cup around the corner, I finally made it out to Chicago’s famous Ribfest. While there is another similar festival out in Naperville, the Chicago one apparently is the best in the entire city for the summer. That really means something since there are ten billion street fests in Chicago for every type of cuisine, ethnicity, and music genre. Why so many? Oh, let’s just say when the winter hits Chicago, you don’t want to be anywhere outside, especially this past winter. 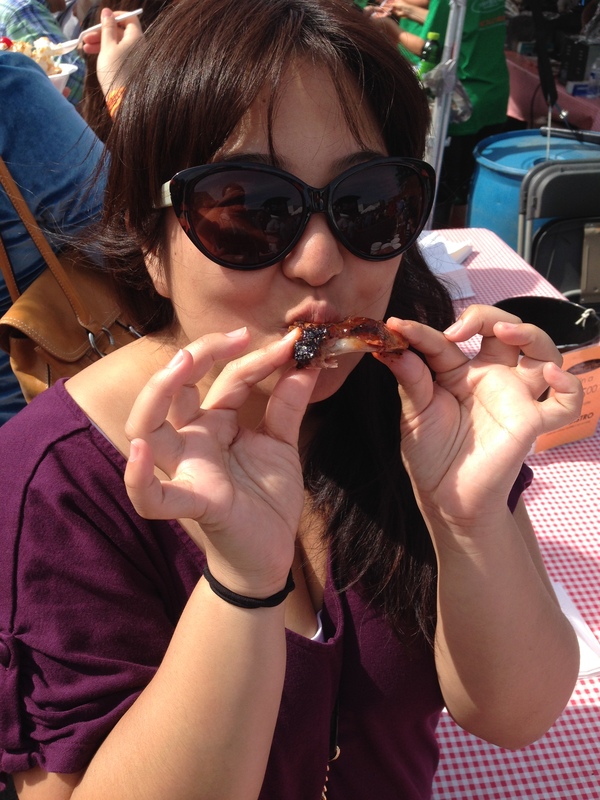 Ribfest is typically a three day event complete with music, games, and oh yeah, the food, including an amateur rib eating contest! Perhaps this video could give you a good idea of what it’s like to be there minus the crushing claustrophobia Janice and I experienced on the wonderful Sunday afternoon we spent there. We could see rib vendors from all over the Chicagoland area and the USA. After dodging millions of the food zombies slowly grazing and ripping apart various foodstuffs while shuffling slowly down Lincoln Ave., we ended up at the Mrs. Murphy and Sons Irish Bistro tent. We had to try it since it has now won best ribs at the fest for the fifth year running. 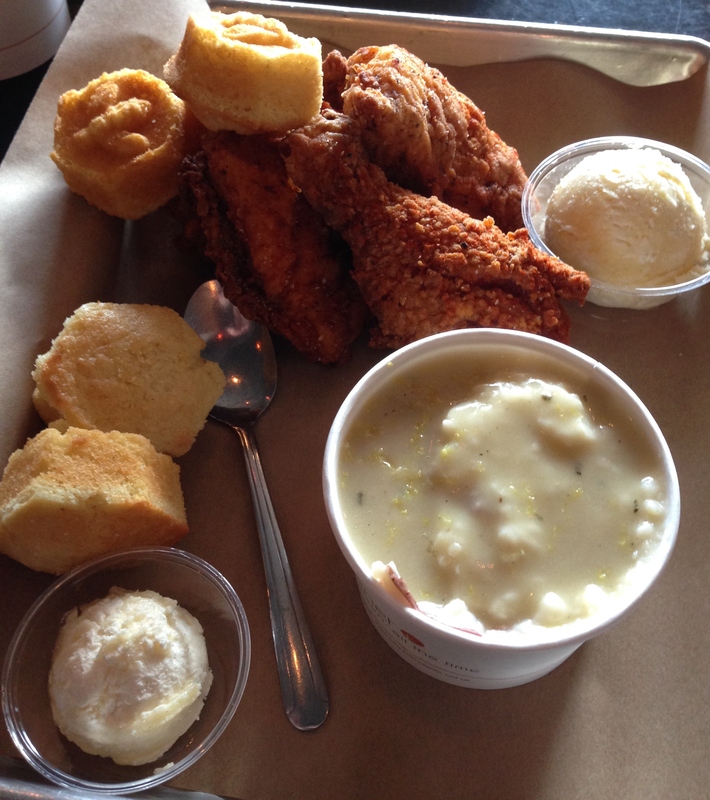 We got a sampler, and it was absolutely finger-lickin’ good. The whiskey laden sauce coated every inch of these fall-off-the-bone tender ribs. The sauce was smoky yet quite sweet, but the only downside was that I felt that there could have been more meat on the bones for the price. 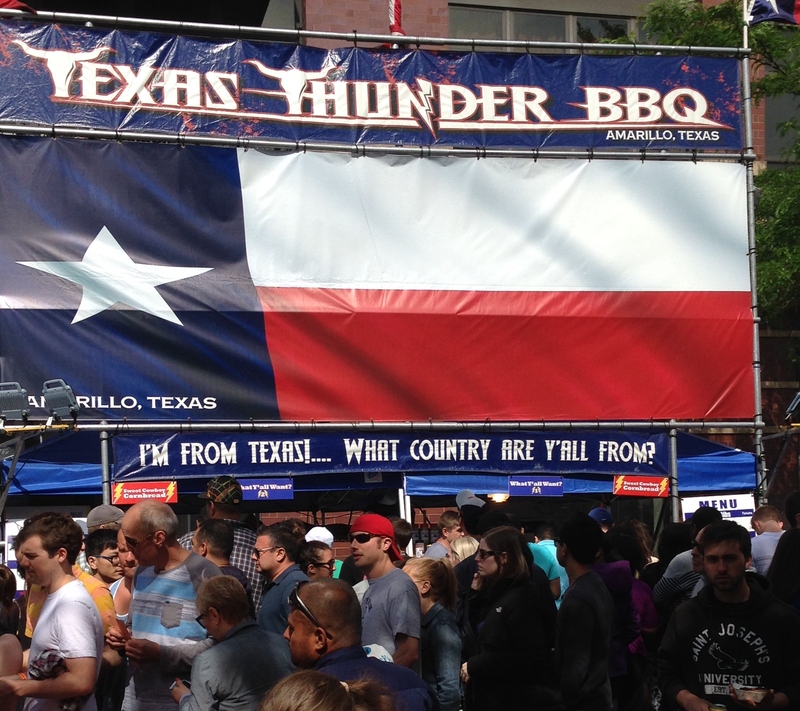 After those tiny but tasty buggers, we moseyed on back to the Texas Thunder BBQ tent because you can’t mess with Texas! Not only did we splurge for a rib sampler but also a side of the sweet cowboy cornbread. I was much more satisfied with these bad boys since everything definitely was bigger in Texas. These Flintstone-sized ribs were more my speed since they had plenty of meat along with a spicier sauce that had hints of cayenne pepper. Not only that, but the cornbread was the best cornbread I’ve ever had. Not only was it sweet, but it was moist and spongy which allowed them to soak up some of the bbq sauce to create a spicy and sweet treat. It was a great day. 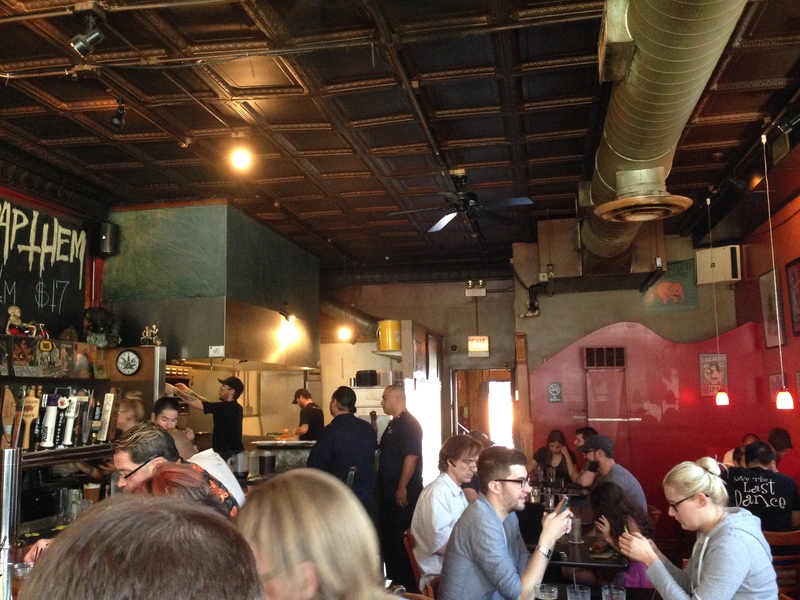 Posted in American Cuisine, Barbecue, Burgers, Comfort Food and tagged bread, Chicago, corn, eating, fest, northside, review, ribs, sauce, smoky, spicy, sweet. Bookmark the permalink. Hey, everyone! Sorry for the wait, but I’ve been busy as of late with tutoring. However, I hope you’re ready for a finger-lickin’ good blog post today on Mastication Monologues! 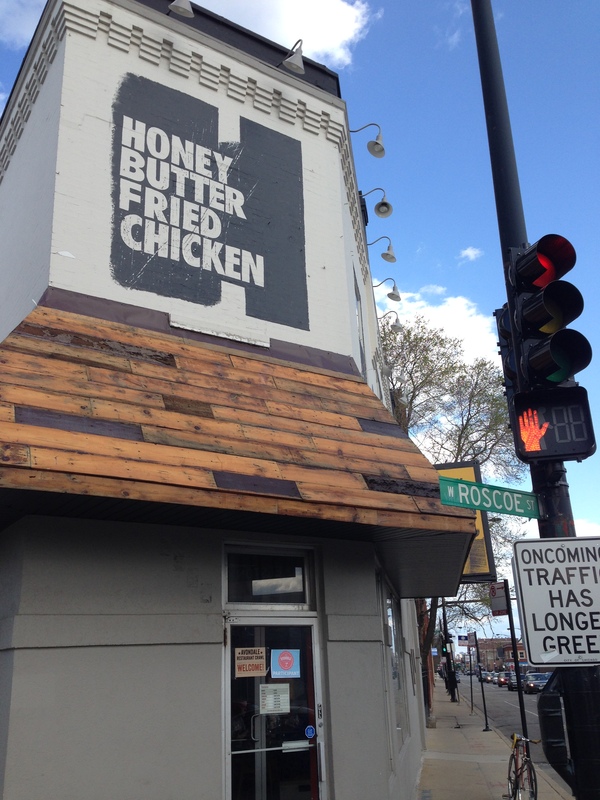 While I have my affinity for certain fried chicken chains over others, Honey Butter Fried Chicken in Chicago has quickly become one of the best places I’ve ever had the artery-clogging, guilty pleasure. After a fun day out on the town with my friend Janice, we decided to try Honey Butter Fried Chicken for lunch dinner or as we called it, “linner”, or perhaps “dunch” would work just as well. That portmanteau was born out of the fact we went to eat around 5 pm since we’re old people deep down inside. 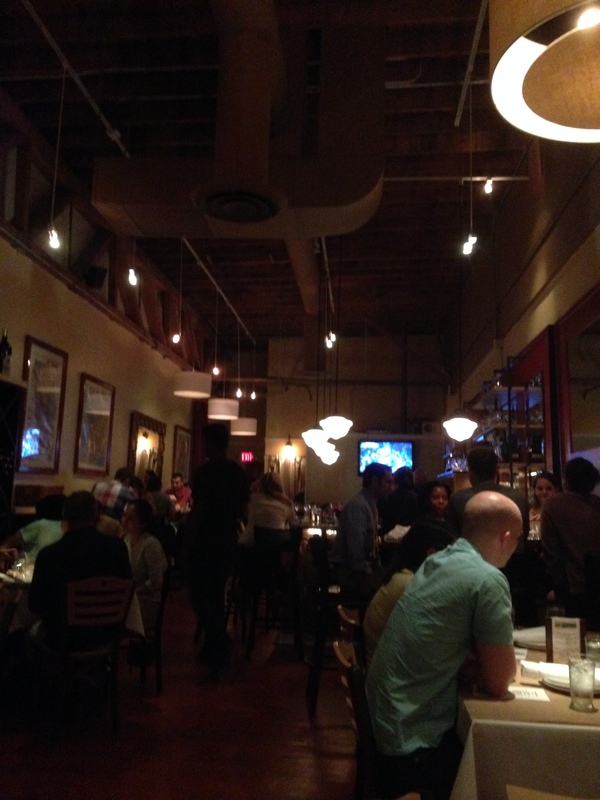 I didn’t expect the restaurant to be as busy as it was at that time of day. We went in line, and there was a sense of pressure as the line continued to form behind us. As my pulse quickened and my eyes scanned over the fried chicken, sandwhich, and sides options, I eventually went for a four piece chicken platter ($15; too expensive) and a side of schmaltz smashed potatoes ($2.75). We quickly jumped off to the side as the tide of customers ebbed forth, and we decided to sit out on the patio that is in the back of the restaurant. However, Chicago that day decided to live up to its nickname the Windy City by greeting us with chilly blasts of wind that made us retreat into the main dining room (though the Windy City name doesn’t come from the weather phenomenon). Once settled in a more comfortable eating environment, bar the proximity of the tables to each other which invades a bit of your privacy, our food was brought out to us. It was smaller than I was anticipating for the price, but I was judging a crusty brown book by its cover. While the corn was run of the mill, it was kicked up a notch with Thai green curry. What that meant for each forkful was that the buttery corn flavor brought a subtle citrus zest that really surprised me in a good way. By the end of the meal, I was happier than a rooster in a hen house. So if you’re looking for a new take on fried chicken that goes beyond the standard establishments and normal price range, check out Honey Butter Fried Chicken. Posted in American Cuisine, Barbecue, Chicken Wings and tagged butter, Chicago, chicken, corn, creamed, fried, honey, mashed, muffin, northside, potatoes. Bookmark the permalink. Hola a todos y bienvenidos a un capítulo nuevo de Mastication Monologues! For those who don’t habla the espanol, I basically said, “what’s up and welcome!”. Anyway, the reason why I busted out the Spanish is because I tried Paraguayan food for the first time today. 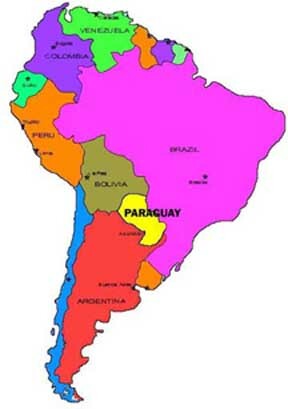 Now, if you don’t really know South America, there are basically two countries that dominate the world’s imagination when anyone mentions the continent: Brazil and Argentina. These two nations have become so famous thanks to their futbol teams/players, food, women, and not to mention the fact that they’re gargantuan and take up most of the continent. Therefore, little landlocked Paraguay doesn’t stand a chance to have its voice heard on the global stage when it’s being drowned out by samba, tango, and pan pipes from Bolivia. Somehow a slice of this South American minnow landed in Itaewon in Seoul in the form of the restaurant Comedor or “dining room” in Spanish. 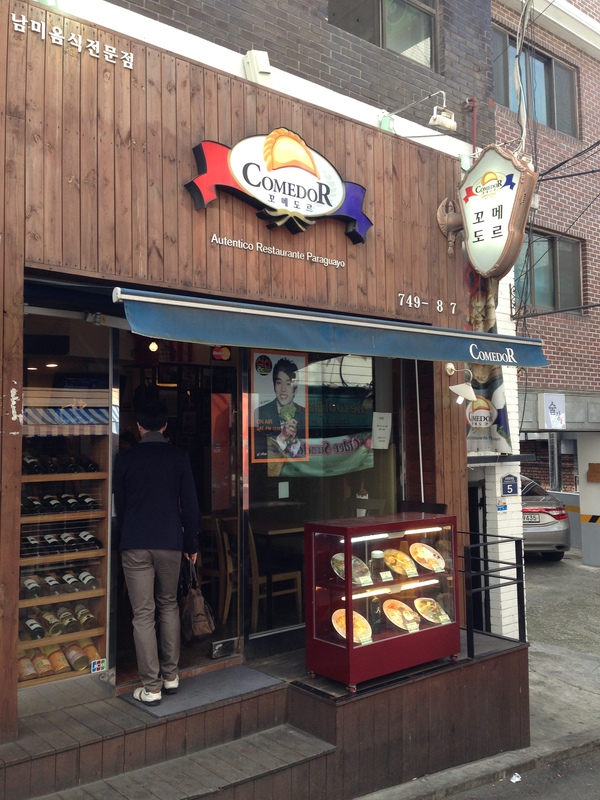 It’s located at 130-3 Itaewon-dong, Yongsan-gu, Seoul (서울시 용산구 이태원동 130-3). You can get there by walking out of exit 4 of Itaewon Station and turn around. Take a right at the intersection and then take another right at the small alley. Comedor will be on your left across from Wolfhound Pub. The inside is very cozy and could probably hold only 10 people max at a time, but I personally preferred it to a large, noisy place. There was only one waitress in the place which added to the homey atmosphere. 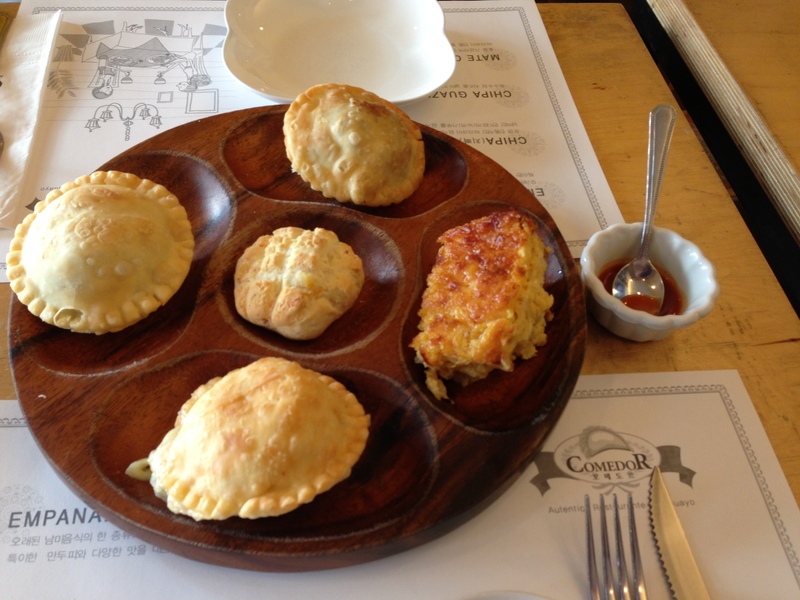 The menu consisted of individual empanadas (small pockets of meat, cheese, and vegetables) ranging from (4,000-6,000 W), menu of the day, and sides like chipa which is a native Paraguayan bread. I ended up getting the combo platter (14,000 W) which consisted of three different types of empanadas, regular chipa bread, cheesy chipa bread, and a beverage. For my beverage, I wanted to get mate tea (cocido 4,000 W, caliente and terrere varieties 6,000 W) which is the national drink of Paraguay and consists of brewing the leaves of the yerba mate plant. Even though it wasn’t part of the combo deal, my waitress didn’t charge me for it probably because I spoke Spanish with her (hint hint for all you hispanohablantes out there). When it came out, I didn’t know where to start first, but who was I kidding? I was going straight for the empanadas. First, there was the cheese and corn one. 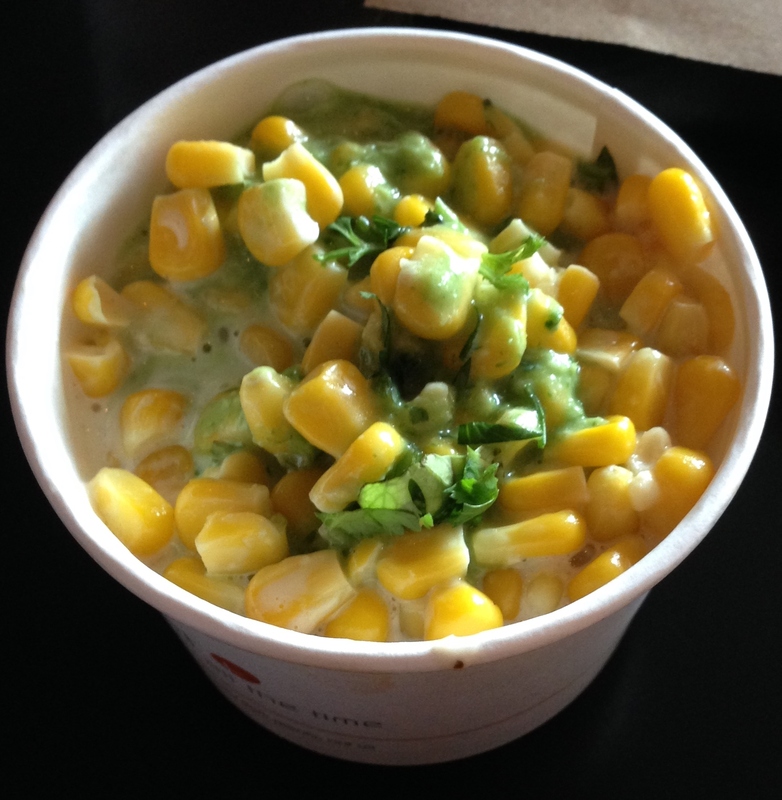 It was a great combination since the corn was very sweet, and the cheese was slightly salty and gooey. The flaky pastry crust was a golden blanket that kept these two ingredients piping hot which really brought out the flavors even more. I splashed some of the spicy Tabasco-esque sauce from the side bowl on top of a piece, and it was a spicy, salty, sweet fiesta in my mouth. 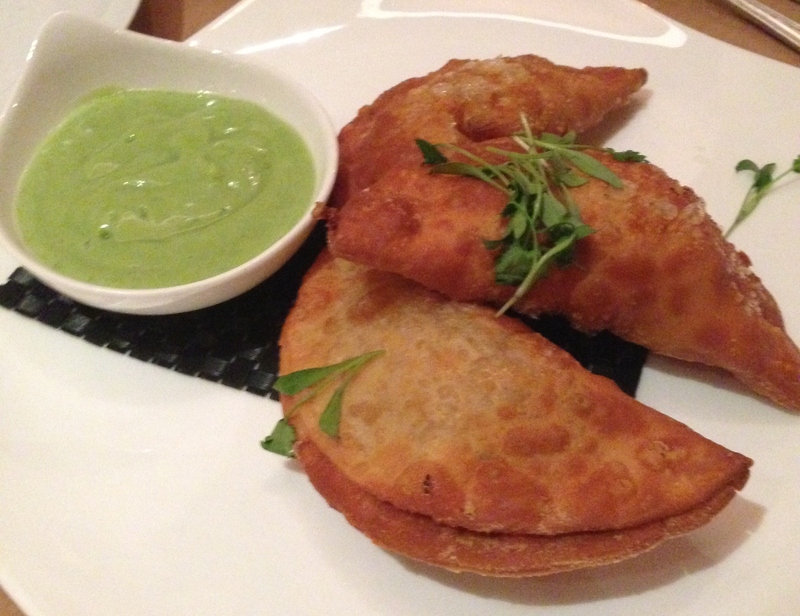 Next came the chicken empanada. I wasn’t really blown away by this empanada since the chicken was on the dry side, but the pastry was still executed to excellence. 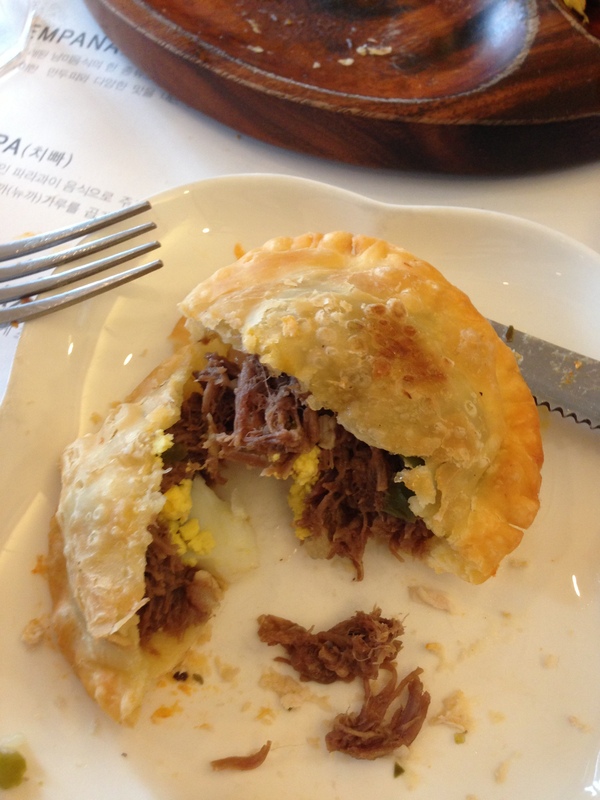 As for the final beef empanada, I was a bit surprised because not only did it have seasoned ground beef in it but also hard boiled egg crumbles. 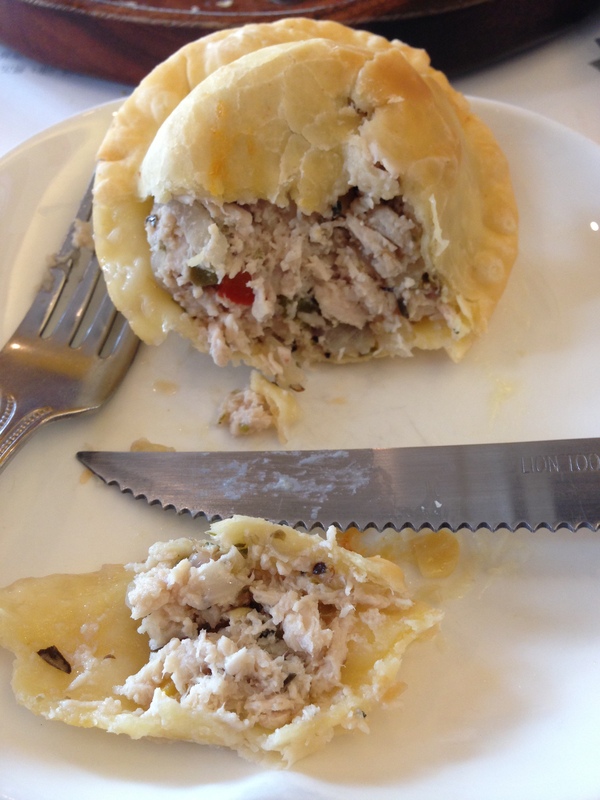 This added an extra flavor/texture dimension to another possibly pedestrian empanada. So out of the three I tried, the cheese and corn one stood head and shoulders above its less flavorful companions. Then there were the two types of chipa bread whose name comes from the indigenous Guaraní language of Paraguay that still is widely spoken. I tried the cheesy chipa first, and it was like corn bread mixed with Cheetos in a good way, i.e. it wasn’t as radioactively orange, and I didn’t get the cheese dust all over my fingers. Once I forked every last crumb down, I attacked the yuca chipa bread. 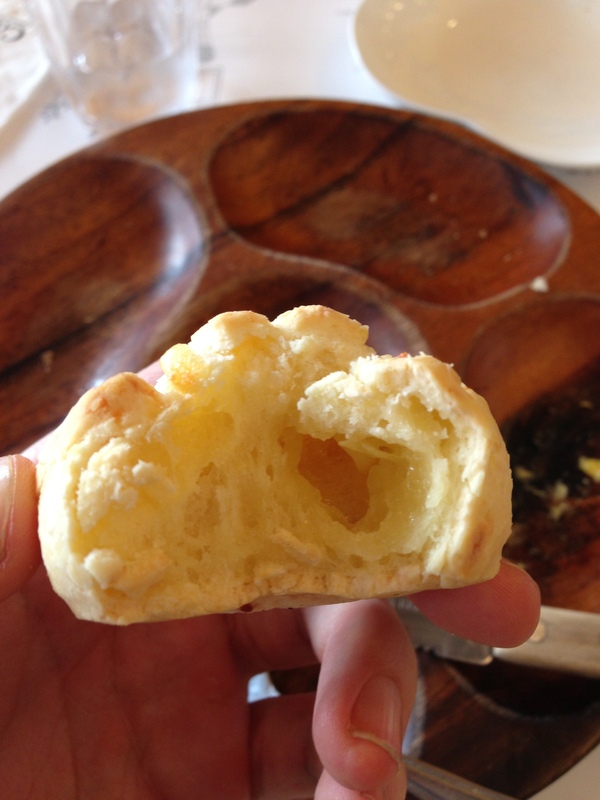 It was a great last piece of the platter because it was very similar to the Brazilian pão de queijo or “cheese bread”. It’s exactly what it sounds like. The actual bread was ever so crispy on the outside but quite soft/pliable which gave way to a moderate, interior coating of fresh white cheese. To drink, it was a bit of folly on my part. As I said before, I ordered mate tea, but there are three different types on the menu: cocido (cooked), caliente (hot), and terere (cold in Guaraní). I got the cocido thinking it was the traditional mate served out of a gourd with a metal straw, but instead I got the gentrified version of it in a fine china teacup. Qué lastima! Turns out the other two were the traditional versions. Nevertheless, it was a potent brew that reflected its indigenous roots in every sip through a mostly herbal flavor profile while being consumed in a European manner. One could say it was a microcosm of Paraguayan society within one cup of tea. So if you’re tired of eating the same old tacos and nachos at Vatos in Itaewon, try out Comedor for some rare South American fare. Posted in Paraguayan, South American and tagged beef, bread, cheese, chicken, chipa, corn, empanada, mate, Paraguay, South America, tea. Bookmark the permalink.